One American official killed as Islamists attack the U.S. consulate in Benghazi, Libya, over "film which offends Islam." An armed mob protesting over a film they said offended Islam attacked the U.S. consulate in Benghazi on Tuesday and set fire to the building, AFP reported. One American official was killed in the attack, witnesses and officials said. Abdelmonoem al-Horr, a spokesman for the Libyan interior ministry's security commission, told the French news agency that rocket-propelled grenades were fired at the consulate from a nearby farm. Security forces and the interior ministry were trying to contain the situation, he added. The attack happened hours after a similar group of hardliners waving black banners attacked the U.S. embassy in Cairo and tore down the American flag. It was not immediately clear if the two incidents were coordinated. The protests came on the eleventh anniversary of the attacks of September 11, 2001. The demonstrators are expressing their outrage over a film deemed offensive to the Prophet Mohammed. The film was produced by expatriate members of Egypt's Christian minority resident in the United States. She added that U.S. officials were working with the Libyans to secure the compound, and said that the earlier protest against the U.S. embassy in Cairo, in which demonstrators scaled the walls, had now ended. 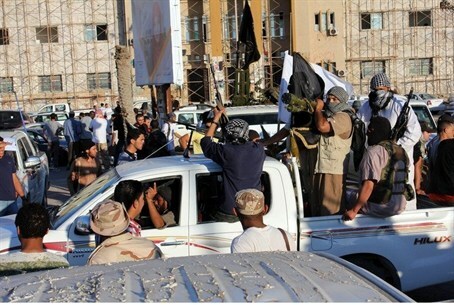 “Demonstrators attacked the U.S. consulate in Benghazi. They fired shots in the air before entering the building," Libya's deputy interior minister, Wanis al-Sharif Sharif, who is in charge of the country's eastern region, told AFP. "Dozens of demonstrators attacked the consulate and set fire to it," said a Benghazi resident, who only gave his name as Omar, adding that he had seen the flames and heard shots in the vicinity. Another Libyan witness said armed men had closed the streets leading up to the consulate, among them ultra-conservative Salafists.